Citrus growers can play a critical role in defeating citrus greening disease by scouting for trees that have escaped the dreaded disease spread by the Asian psyllid. By ferreting out, and reporting these trees, they can help breeders reproduce them more quickly, and buy the industry more time to eradicate the disease. A new rule change (5B.62) enables breeders to get to work on propagating these citrus varieties without waiting for the state to test them for exotic diseases – a process that normally takes two or three years. As a result of the change, breeders can begin reproducing these escape trees while testing is ongoing. The rule change was requested by the Florida Department of Agriculture and Consumer Services’ Division of Plant industry, through its Citrus Budwood Technical Advisory Committee (CBTAC), and approved by Agriculture Commissioner Adam Putnam. It allows breeders from the University of Florida-Institute of Food and Agricultural Sciences (UF-IFAS), the U.S. Department of Agriculture and private companies to accelerate the propagation of trees showing resistance or tolerance to greening. 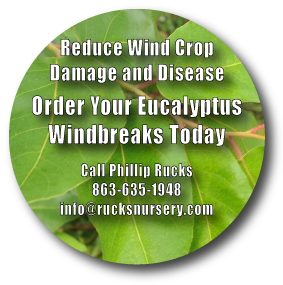 At Phillip Rucks Citrus Nursery in Frostproof, we are poised to work as a contractor to breeders in propagating escaped trees. It’s an opportunity for all of us to rally together. As an industry, we work around thousands of trees every day. I am convinced there are trees infected with HLB that are tolerant or non-symptomatic and resistant. We need to find them. If they have good production, they are surviving. When you find these trees, report them to your local IFAS citrus agent, who will arrange an inspection. Growers in Polk and Hillsborough counties should contact Chris Oswalt at wcoswalt@ufl.edu. In Highlands County, contact Laurie Hurner at lhurner@fl.edu. In Hardee and DeSoto counties, contact Dr. Stephen Futch at shf@ufl.edu. In Lake, Orange and Seminole Counties, contact Gary England at GKE@ufledu. Dr. Harold W. Browning, Citrus Research and Development Foundation’s chief operations officer, says researchers will try to determine if the trees are truly resistant to HLB, or if something in the soil is keeping them healthy. We have to improve our industry in the ways we know we can. This is something we all can do. We also need to be diligent in removing dead and diseased trees that can harbor the Asian psyllid. For instance, abandoned citrus acreage or feral citrus plants, even what’s been replanted to pines, should be removed. It can introduce disease and threaten the survival of other citrus trees. The Citrus Health Response Program (CHRP) already has improved control of disease-carrying pests. This entry was posted	on Monday, March 16th, 2015 at 10:46 am	and is filed under Uncategorized. You can follow any responses to this entry through the RSS 2.0 feed. Both comments and pings are currently closed.